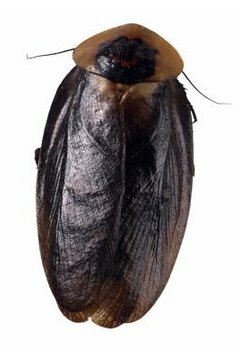 You may think of roaches as disgusting pests, but the orange spotted roach (Blaptica dubia) isn't quite like a household cockroach. These roaches are popular pets and are bred as a food for reptiles. While the species is native to tropical rainforests, creating a suitable habitat isn't difficult or expensive. Orange spotted roaches aren't too picky about where they live. A glass or plastic tank with smooth, vertical walls is just fine for them. You can identify males by their longer wings, although neither gender is capable of flight, according to Herp Center Network. While they aren't great climbers, roaches can traverse rough surfaces so don't use ridged plastic or cardboard to contain them. The tank should have a secure screen or other perforated cover to keep cats and other unwanted guests out of the habitat. If there's one thing that roaches like to do, it's hide. They prefer to forage at night and take cover during the day in their native environment. Give them some shelter by cutting an egg carton in half or cutting pieces of cardboard out to make a structure. While the roaches won't mind walking around on the tank's bare floor, you can make it feel more like home by adding up to an inch of peat moss or aquarium mulch, according to Home Science Tools. Roach ranches can be as simple or complex as you want them to be. Dry food is fine for a roach's everyday diet. You can feed them pretty much any food suitable for an animal or person, including cat chow, fish flakes and cereal. It's recommended that you give roaches a diet of dry food with two or three "fresh" meals of fruit or vegetables each week, according to South Texas Dragons. The fresh meals help provide moisture, which these roaches desperately need. They also need access to fresh water all the time, but a filled water dish is a drowning hazard for them. Instead, place a sponge or water-absorbent crystals in the water dish. Roaches thrive in very humid environments. If they get stuck during the molting process and their skin doesn't come off completely, then you'll need to increase humidity in the tank. Orange spotted roaches are tropical animals, so they can't tolerate cold temperatures. The minimum safe temperature for a roach habitat is 68 degrees, but they won't reproduce unless the temperature reaches at least 90 degrees during the day, according to New York Worms. Maintaining a temperature around 70 degrees is fine for the roaches, but it prevents them from having babies. Orange spotted roaches give birth to live babies, so you won't see any eggs in the tank if they do mate.